I'm often asked, "Why should I use Cardas cable instead of standard zip, 12 awg Parallel Twin, or the wire that came with my system?" Pure musical accuracy, "that you can hear", is the obvious answer. There are many small points of degradation between the musician and the listener in an audio chain. Some are very obvious, both to the ear and with measurement. Others are more subtle, but part of the cumulative mud. Many things that contribute to the mud can also be measured. There are many easily performed measurements that show the difference between cables. With a little experience you can even predict sound anomalies by looking at wave form characteristics and input/output comparisons. The sound, or wave form and input/output comparisons of 12 gauge, bare stranded zip cord contrast nicely with our entry level cable, Crosslink. Here are a couple of simple input/output tests, using both impulses and white noise. The test equipment used is a Tektronics TDS 350, and a Muse 150 watt amplifier. 10 foot cables are tested by running the signal into a 6 ohm, .4 mf load, to dramatize a poor cable condition. A probe is placed on the originating and terminating ends of the cables. 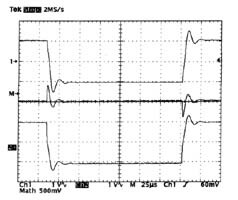 The input/output signals are compared in the TDS 350 and the difference between them is seen on the "M" line. In Test 1, a 2.8 k square wave is used to compare impulse response. 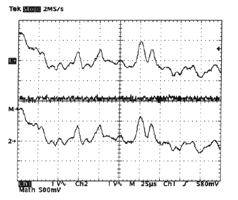 In Test 2 a pink noise source is run through the cable at low level. Another interesting and readily observable test is the triangle form. This represents the cable’s ability to replicate a constant current change. 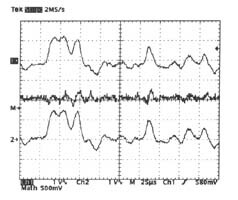 In this test a comparison is done between the loss spectra of the parallel twin and the Crosslink. The input signal is at 1v or 0 db reference. The loss spectra for the parallel twin shows approximately - 7.2 mv or - 40 db. The spectra for Crosslink shows approximately - 3.3 mv or - 47 db. The loss spectra in both cases is a ghostly phase shifted replica of the original form that is subtracted from the signal. I feel the amount and character of this degradation is one good measure of a cable’s quality. Additionally, inductance and resistance measurements are taken using a Stanford research SR 715 and a 10 ft. length of the respective cable. There are many speaker and interconnect cables on the market. I suggest you listen to the difference between any typical parallel twin and 12 gauge twisted pair. If you can’t tell the difference, don’t spend your money on high end cable. Focus your system a little better. Unlike video cables, audio cables do not live in a matched impedance world. The wavelength of the audio signal is too long to establish a true transmission line. Impedance characteristics dance all over the place. This, combined with the necessary high impedance termination supplied by the audio components, creates a very poor situation. The electrical and electromechanical qualities of the cable are no longer nulled, as they are in the "perfectly balanced transmission line". Cables that look pretty good in the 75 ohm or 110 ohm, balanced world suddenly ring like a bell and become microphonic and misbehave in general. If you try to maintain resolution over a 124 db or even a 100 dB range (not an issue with video), the ringing becomes significant. Interconnects are no different than capacitors with respect to the effects of capacitance x dissipation factor. A cap that measures poorly will not display good low level resolution characteristics and neither will a cable. The next time you measure the dissipation factor on a capacitor, instead of plugging the leads into the little clippy things on the meter, use a pair of Radio Shack clip cords to bridge it to the meter. 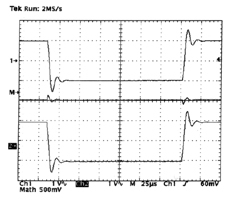 You will see that the cap leads make a very measurable difference in capacitor performance. Good interconnect cables measure like good capacitors. Cables that measure like bad capacitors, sound like bad capacitors. There are many good economical interconnects on the market. My cables are better by a subtle but measurable margin. That margin matters to some, to others, it does not. The recording and mixing studios that really are about the resolution of their sound, like Ocean Way or Grundman Mastering, use tens of thousands of feet of specialty audio cable. If you were to look at one of Grundman's new studios, you would find that every inch of conductor, even inside the boards and recorders, is Cardas Litz. You can hear a difference if you listen.You can measure it if you try.